Guest Blog: Writers Workshops – Corey M.P. Hi writers. 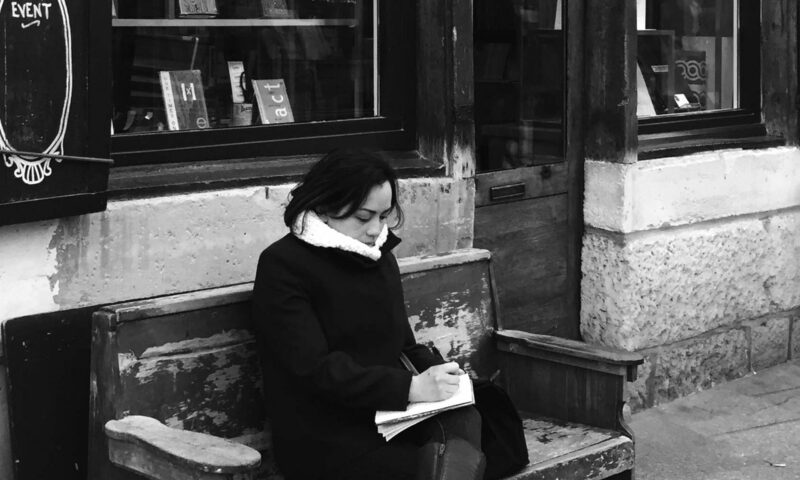 It’s been a while since I’ve had a Guest Blogger, so I thought I’d ask a new friend and fellow-blogger who I met at the Paris Writers Workshop, to do me the favor of writing a guest post. I immediately thought of the wonderful, Kristen Coros. Our topic for this guest post will be: Writers Workshops. Intro: I am a Canadian blogger and aspiring fiction writer currently living in Zürich, Switzerland. I met Corey at the Paris Writers Workshop in June, and I’m honoured that she asked me to provide a guest post for her blog. Below, I’ll give my take on why writing workshops are worth attending. You need other writers to read your work, writers who have struggled with and thought about the same issues of narration, plot, dialogue, and characterization with which you are now grappling. And while you might be able to find fellow solitary key-peckers in your area who are willing to meet and swap work on a regular basis, I would argue that additional benefits are accrued from attending a writer’s workshop. As a three-time veteran of Zürich Writers Workshop weekend events and a recent attendee at the weeklong Paris Writers Workshop, I’ve observed the following three benefits of these organized events. The presence of a leader. Critique groups can sometimes be overly informal, devolving into too much chatting, joking, or complaining, and not enough productive discussion. In a workshop setting, a leader – typically a writer who has been published to some acclaim – acts as a facilitator to keep things focused and to ensure that there is equal time for everyone’s work to be discussed. They can also help to interpret the feedback being given. While my piece was being discussed at the first workshop I attended, a fellow participant looked at me and said, “Your underwear is showing in this piece.” It was an essentially useless (and potentially hurtful) remark before our leader was able to draw out and rephrase its meaning. Equal footing for the participants. In a workshop, it’s typically the case that every attendee must submit the same amount of writing beforehand (at events I’ve attended, the amount has ranged from two to twenty pages). The leader does not submit anything, but their work is available for scrutiny at your local bookstore. It helps to have everyone in the same boat, as opposed to informal groups where some people may be frequently submitting and others hardly ever. When everyone is equally invested and vulnerable, each member of the group will be more likely to deliver what they themselves are seeking – honest, helpful feedback delivered in as kind a manner as possible. Chances to meet people you wouldn’t otherwise. The workshops I’ve attended have introduced me to a wonderful and geographically diverse set of like-minded writerly people (such as the lovely Corey! ), many of whom I’ve kept in touch with afterwards. As noted above, being a writer can feel very isolating, so workshops can offer a great sense of your community and networks growing. After having sung these praises of the workshop, I will note, in closing, that there is a time to workshop, and a time to head back to your desk alone. To paraphrase Stephen King, whose memoir/instructional book On Writing I love abidingly, writing itself needs to be done in solitude, with the “door closed” and only your own voice in mind. So after our wonderful week in Paris, it’s time for me to cloister away again. Thanks for that post, I thoroughly enjoyed it.